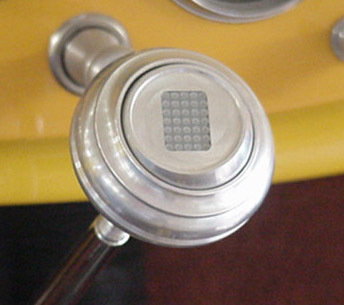 Street Dreams has a flexible, programmable shift indicator that can work with most automatic transmissions used in street rods. It can operate on both three speed and four speed (3 + overdrive) transmissions. compact "main brain" enclosure - 5" x 2" x 1". This is available for the circumstances that the sensor cannot be installed in the shift console. This sealed design has been tested such that it could be submersed in water and still function. Stainless steel mounting brackets are also included. We usually install a position sensor in the shifter console, so this option is rarely needed. The linear display shows: P R N O D 2 1. Each character is backlit by its own LED. Most common LED colors are available. A custom color charge applies for special colors, such as blue. Street Dreams also offers a 1" diagonal single character readout that gives a bold, easy to read display. A Custom display mount is shown, we installed a display into a shift handle per customer request. The overdrive indication is not shown. We have bright red, red, orange-yellow and green. Display mounts are available in circular, rectangular and spherical styles. Shown above is the spherical style custom mounted into one of our shift knobs. Shift knob and tubular handle sold separately. Last updated August 23, 2005.